A dab of blue here, a splash of red there, a goopy smear of green . . . everywhere. To the tune of "It Ain't Gonna Rain No More," one creative kid floods his world with color, painting first the walls, then the ceiling, then HIMSELF! Before this feisty artist is through, he'll have painted his head, back, hands, legs, feet, and . . . Oh no--here comes Mama! Karen Beaumont's zippy text and David Catrow's zany illustrations turn an infamous childhood activity into raucous storytime fun, giving a silly twist to the fine art of self-expression. Karen Beaumont is known for her lively and celebratory picture books, including I Like Myself! 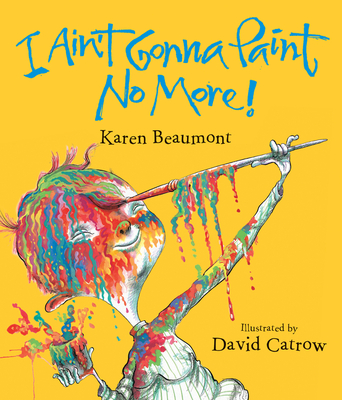 and the New York Times best-seller I Ain’t Gonna Paint No More!, both illustrated by David Catrow, as well as No Sleep for the Sheep!, illustrated by Jackie Urbanovic, and Wild About Us!, illustrated by Janet Stevens. She lives in Northern California. For more information, visit www.karenbeaumont.com.